Edens Structural Solutions specializes in Foam Concrete Lifting right here in Oklahoma City! Give us a call today at (405) 260-9320. Our High Density (HD) Polyurethane Concrete Lifting Foam could be the ideal solution for slab repairs or concrete repairs if you have noticed sunken areas or cracks in the floors, sidewalks, porches or driveways of your Oklahoma City home. Since 1983, the Edens mission has been to give Oklahoma customers the best in foundation repair services and solutions. Being locally owned and operated right here in Oklahoma, we understand our reputation matters and work to serve our customers with Integrity and Intelligence! We perform FREE on-site estimates for every job and have developed our Solid Ground Rebate Program that will pay up to $300 towards a third party engineer’s report. We take these extra steps to ensure the solutions we recommend are the right solutions for our customers. Fill out the form below or call our office today to schedule your FREE on-site estimate. What makes High Density (HD) Polyurethane Concrete Lifting Foam the Ideal Solution? Edens HD Polyurethane Lifting Foam gently elevates your slab or other damaged concrete, in an effort to restore the stability and structural integrity of the affected area. It is also one of our preferred solutions for waterproofing basements or other areas that are susceptible to water damage. Edens HD Polyurethane Lifting Foam is an efficient, cost-effective way to elevate your slab with minimal disturbance to your home or your schedule. The foam is applied through small 5/8in holes in your slab that are often made without the hassle of tearing up carpet or moving heavy furniture. The entire process is usually completed within 1 business day and the results are immediate. 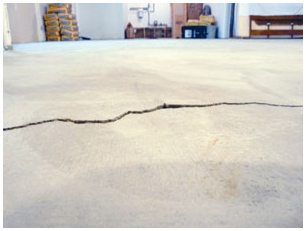 Rely on the company with over 30 years foundation and concrete repair experience, Edens Structural Solutions! The Edens mission has been to give our customers in Oklahoma City the best service and foundation repair solutions at a competitive price. Give us a call today at (405) 260-9320!